Alar adjustment is a surgical procedure that reduces flared or wide nostrils. The outer edges of the nostrils are called the ala. Alar adjustment is typically performed along with width reduction. The surgeon removes a portion of tissue to adjust the level of tension that is leading to the excessive nostril width. The Weir technique is a specialized alar adjustment approach that involves a specific incision type. The surgeon removes tissue to develop a wedge-shaped void and then sutures it to create desirable contours. Certain ethnic patients tend to have wide nostrils along with a nasal flare. African American patients usually have this type of nasal anatomy. Some patients feel that their wide and/or flared nostrils distract from other facial features. This can have an adverse effect on an individual’s self-esteem. Board certified facial plastic and reconstructive surgeon Dr. Eric Yavrouian provides nose reshaping surgery to patients in Glendale, Pasadena, Burbank, Greater Los Angeles, Beverly Hills, CA, and surrounding locations. The surgeon will remove a wedge of tissue from the side of the nostrils near the junction with the cheek in a procedure known as alarplasty. The wedge base will at the level of the alar rims, and the pointed apex will be near the sides where the nose connects to the cheek groove. The amount of tissue removal will depend on the width of the nostrils. Many rhinoplasty surgeons and patients try to measure the change in mm narrowing on the frontal view. However, this can be challenging as the wedge size that is removed does not accurately reflect the frontal narrowing distance. The surgeon will explain to the patient whether they need a minor, medium, or dramatic change. Most patients want a medium change. Patients should understand that it is always possible to remove more tissue later on if they feel that their nostrils are still excessively wide. But the excision of substantial amounts of tissue is difficult to reverse. Some nose surgeons use a suturing technique to draw the walls in medially. However, this can lead to bunching. Yet other surgeons only place incisions within the nostrils from fear of external scarring. But this technique does not create dramatic changes. Incisions placed on the outside of the nose heal well and can be made inconspicuously adjacent to the alar groove. A skilled rhinoplasty surgeon will make this incision in the area where the nostrils connect to the cheeks. This allows the scar to remain discreet within the natural crease between these regions. Alarplasty, or nostril narrowing, is an effective procedure that offers dramatic results without the need for a full rhinoplasty. The patient will experience some discomfort and pain in the nose region along with inflammation and puffiness during the initial few days of the recovery phase. The pain will gradually subside in two to three days. However, the inflammation will take more time to resolve. Patients typically experience minor bleeding in the incision areas. This bleeding typically resolves in around two days. The swelling on the face starts to subside in around a week and should be completely resolved by two weeks. The patient will need to visit the office to have their bandages taken off in around three days after the procedure. The surgeon will typically remove stitches at the end of the first week. 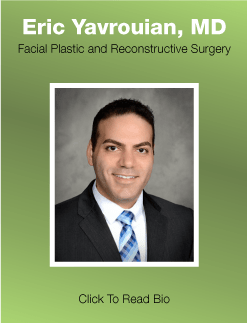 Facial plastic and reconstructive surgeon Dr. Eric Yavrouian receives patients from Glendale, Pasadena, Burbank, Greater Los Angeles, Beverly Hills, CA, and nearby areas for nose surgery.